Will work with models 1100 and 1187. Single point tactical slings attached to shoulder-mounted combat weapons including shotguns such as the highly regarded and widely used Remington 870 are very popular in both military and law enforcement special operations circles. 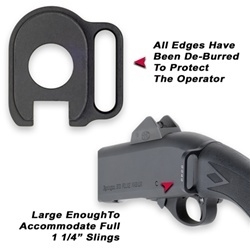 These shotgun sling mount systems permit the operator to mount the weapon on either the primary or offside shoulder. As a result, during dynamic entries it becomes easier to "cut the pie" at doorways and move around corners, whether they are on the right side or left side, without telegraphing the operator's position. In addition, slings attached to a single point mount work especially well when operators are deployed wearing body armor or are involved in breeching operations. The preferred mounting point for slings of this type is directly behind the receiver and in front of the buttstock. GG&G was one of the first to introduce a Single Point Rear Sling Attachment for the Remington Model 870 combat shotguns. The Remington Model will also fit the Remington 1100 and 1187 shotguns. 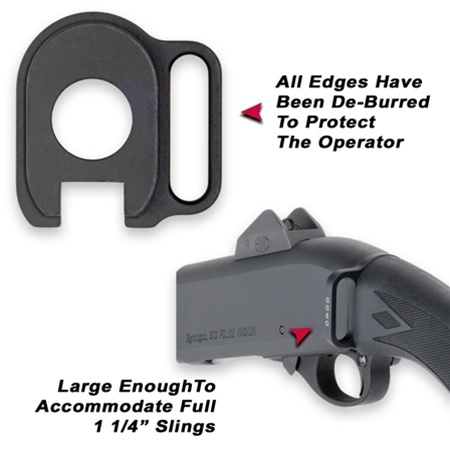 Precision machined from 7075 aircraft grade billet aluminum alloy and Type III hard anodized matte black, this shotgun sling attachment has been designed for the rigors associated with professional use. This GG&G Single Point Rear Sling Attachment will accommodate slings up to 1 1/4" in width and can easily be installed by the operator. A dual point sling system can also be employed with this attachment.